Coachella artists battle for crowds with Lightwave laser displays on multiple stages. Coachella 2014 marks 11 weekends of Lightwave International wowing audiences at the famed festival. 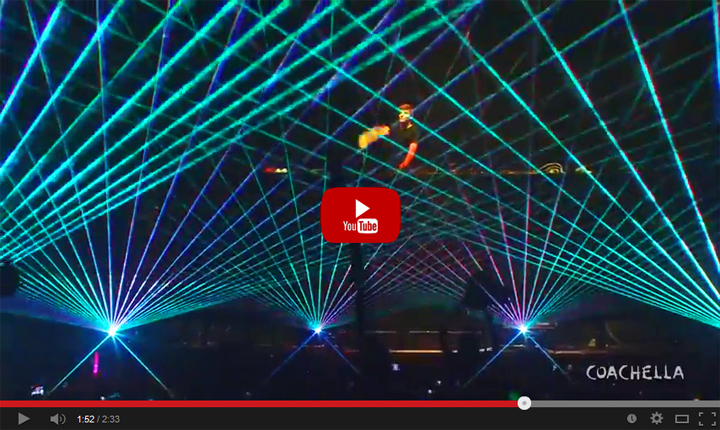 Calvin Harris, Martin Garrix, and Zedd used Lightwave's lasers to punctuate their already impressive visuals. Coachella artists battle for crowds with Lightwave laser displays on multiple stages. Coachella 2014 marks 11 weekends of Lightwave International wowing audiences at the famed festival. Calvin Harris, Martin Garrix, and Zedd used Lightwave’s lasers to punctuate their already impressive visuals. Lightwave’s full color solid state lasers provide effects bright enough to compete with video walls, strobes, and focused lighting effects. Compact casing and lightweight design allow the laser projectors to be integrated seamlessly into stage designs.